The Pantanal of central-western Brazil, eastern Bolivia, and northeastern Paraguay is a 150,500 km2 (approximately the size of the US state of Georgia) alluvial plain that drains the headwaters and tributaries of the Upper Paraguay River basin and forms one of the largest tropical wetlands in the world. On the map, the Pantanal plain is shown in dark green, and the highlands of the upper Paraguay basin are shown in light green. 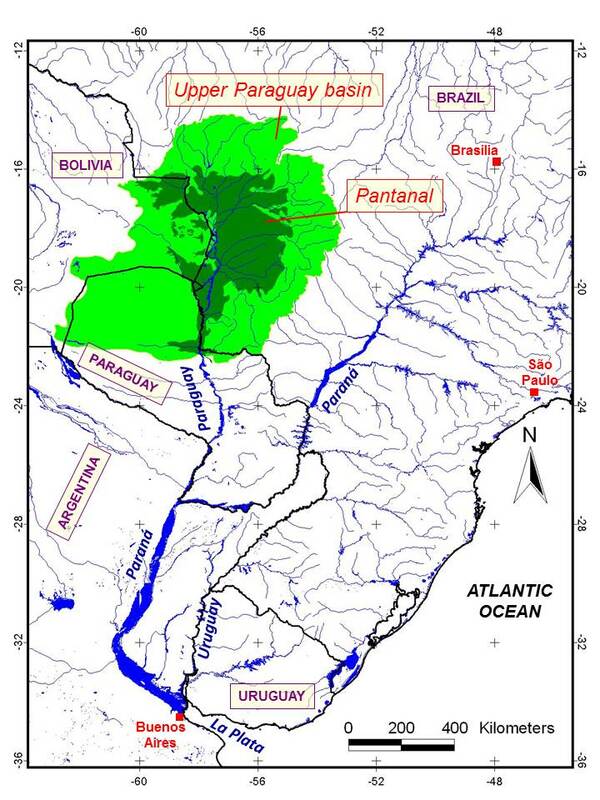 Geologically,the Pantanal is a young Pliocene–Pleistocene age (approximately 2.5 million years)tectonic depression/sedimentary basin that subsided between the uplifted eastern foothills of the Andes and the western escarpment of the central Brazilian plateau. It encompasses a complex mixture of tropical forest, savanna, and aquatic environments adapted to highly variable annual and multi-annual flood cycles. Annual floods may last as long as six months and cover as much as 100,000 km2. The Pantanal provides important ecosystem services for the region, including carbon sequestration, regulation of rainfall and river flows, purification of water by wetland plants, and delivery of nutrients and sediments to extensive floodplains. Much of the eastern highlands bordering the Brazilian portion of the Pantanal are part of the Cerrado biome, a highly-threatened biodiversity hot spot with a range of savanna forest types and many head water streams that drain into the Pantanal. In addition to strong Cerrado influences on the Pantanal’s flora and fauna, species from the Amazon, Atlantic Forest, and Chaco contribute to the flood plain’s rich biodiversity. Video Blog about the Pantanal Project - Part 3 "The Pantanal"
Video Blog about the Pantanal Project - Part 2 "Conservation & the Community"
Video Blog about the Pantanal Project - Part 1 "The Field"